A plethora of churches and monasteries was built in the Prefecture of Rethymnon during both the early Christian and the Byzantine period. Byzantine churches amount to an estimated 300 and 30 monasteries. he prevailing architectural style during the early Christian period was that of the "Basilicas", which were distinguished by their wooden roof and their three aisles, of which the middle aisle was raised. Remains of 18 basilicas of that style have been found in Rethymnon. However, the architectural style that prevailed during the entire Byzantine period, from the 9th century up until the Venetian occupation, was that of cruciform basilicas with a cupola. Both cruciform, and single-aisled domed churches can be found in various places throughout the prefecture and represent true gems in the countryside of Rethymnon. Early Christian and Byzantine churches are not only of great architectural interest, they also display magnificent interior embellishments: mosaics in early Christian basilicas and frescoes in Byzantine churches. The mosaics usually present geometric forms and motifs taken from the realm of flora and fauna. The frescoes in churches, which were built after the 11th century, depict motifs of narrative character. The techniques used as well as the materials change according to the period of time. This became most obvious during the period of the Cretan Renaissance, more precisely from the 15th century and henceforth, when Byzantine iconography and traditional techniques were complemented by elements of the Renaissance of western countries. As already mentioned above, the number of churches is so large that at this point we can only introduce a few of the most important examples. Early Christian Basilica of Panormo - Southwest of the village of Panormo and 30 km east of Rethymnon the largest early Christian church on Crete was excavated in 1948. The basilica has a wooden roof; it dates back to the 5th century and is dedicated to Agia Sofia. Early Christian Basilica of Goulediana - This three-aisled early Christian basilica with rich mosaic ornaments was discovered at the place of Onythe, southeast of the village of Goulediana, which is located 18 km from Rethymno. It dates back to either the 6th or the 7th century. Early Christian Basilica of Ancient Eleftherna - It is situated in the archaeological area of Ancient Eleftherna, at the place of Katsivelos. This three-aisled basilica with rich mosaic ornaments dates back to either the 6th or the 7th century. Agios Ioannis in Gerakari - Outside the village of Gerakari, and 41 km from Rethymnon, is the 13th century church of Agios Ioannis the Theologist. This single-aisled church has a tiled roof. The domed narthex was added later. The church is ornamented with particularly interesting frescoes. Agios Dimitrios - The 11th century cruciform church of Agios Dimitrios inscribed with a cupola is located some 10 km east of Rethymnon on the road to Arkadi in the village of Agios Dimitrios. Panagia in Roustica - This two-aisled church dedicated to the Holy Virgin and Christ the Saviour is located in the area of Livadi in the village of Roustica, 21 km from Rethymnon. The walls in the interior of the church are covered with frescoes dating back to 1381. The belfry shows the inscription of the year 1627. Kera Panagia in Nevs Amari - Located in the wider area of the village of Nevs Amari, is the three-aisled basilica of Kera Panagia which was built in the same place, where an older, cruciform basilica with a cupola dating back to the 13th century was standing. The south aisle with its impressing doorframe and the coat of arms of the Kalliergis family was obviously built later, probably during the 15th century. Agia Paraskevi in the Monastery of Asomatos - West of the Monastery of Asomatos is the Church of Agia Paraskevi, a cruciform church with a cupola, which was probably built during the 13th century and restored during either the 15th or the 16th century. There is a vaulted apse at the north wall of the church in the interior on which two figures with raised hands are depicted. According to the inscription they represent the brothers Theodoros and Georgios Hortatzis. Panagia in Thronos - The village of Thronos in the district of Amari houses the 14th century Church of the Assumption of the Virgin, which was built on top of an early Christian basilica of the 6th century. Part of the mosaic floor of the latter has been uncovered. The walls of the church are ornamented with frescoes dating back to two periods. Agios Eftychios in Chromonastiri - In the area of the village of Chromonastiri and some 12 km from Rethymnon is the single-aisled, cruciform and domed church of Agios Eftychios. The interior walls are covered with frescoes dating back to the 11th century. Early Christian Basilica of Goulediana - This three-aisled early Christian basilica with rich mosaic ornaments was discovered at the place of Onythe, south-east of the village of Goulediana, some 18 km from Rethymnon. It dates back to either the 6th or the 7th century. The Holy Stavropegiac and Patriarchal Preveli Monastery of Saint John the Theologian (Evangelist), known as the Monastery of Preveli is located at the south of Prefecture of Rethymnon and it is the most sacred part of the Holy Diocese of Lambis and Sfakion, in whose the spiritual jurisdiction belongs. The monastery is consisted of two main building complexes, the Lower (Kato) Monastery of Saint John the Baptist and the Rear (Pisso) Monastery of Saint John the Theologian which is in operation today. 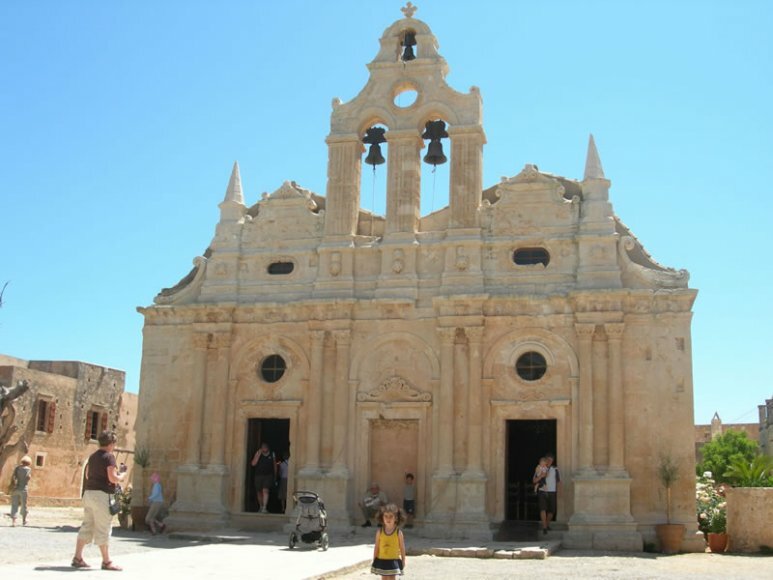 Arsani Monastery lies 12 km east of Rethymnon. It must have been founded during the period of Venetian occupation by a certain monk named Arsenio who gave it his name. There is another opinion, however, which maintains that the name is derived from a certain Arsinoe who left her estate for its building. The cruciform, domed church we see there today was built in 1888 and is dedicated to Ayios Yeoryios. This is the second church, built on the site of the previous one which was consecrated in 1600. The monastery, which houses a museum and a congress centre, was renovated in 1970 and the katholikon decorated with wall-paintings around 1988/90. 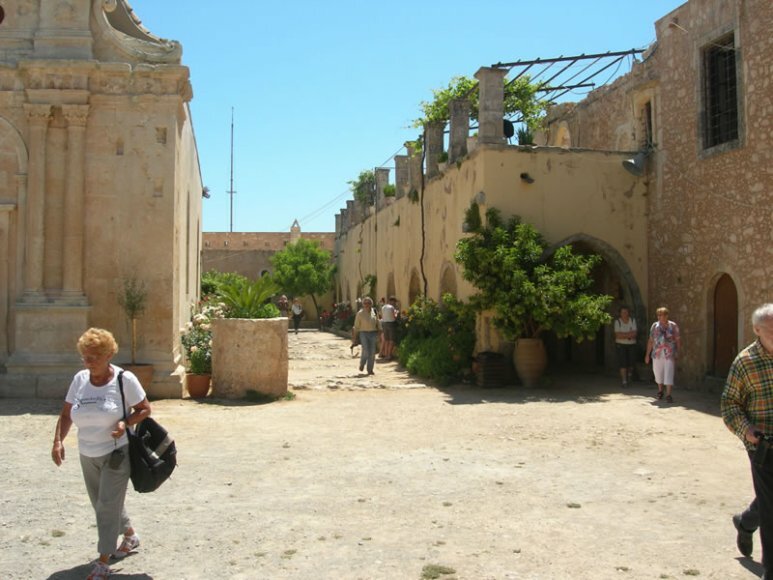 Arkadi Monastery The history of the monastery goes back to Byzantine times, when a monk, possibly named Arkadios, founded the monastery which in turn was named after him. 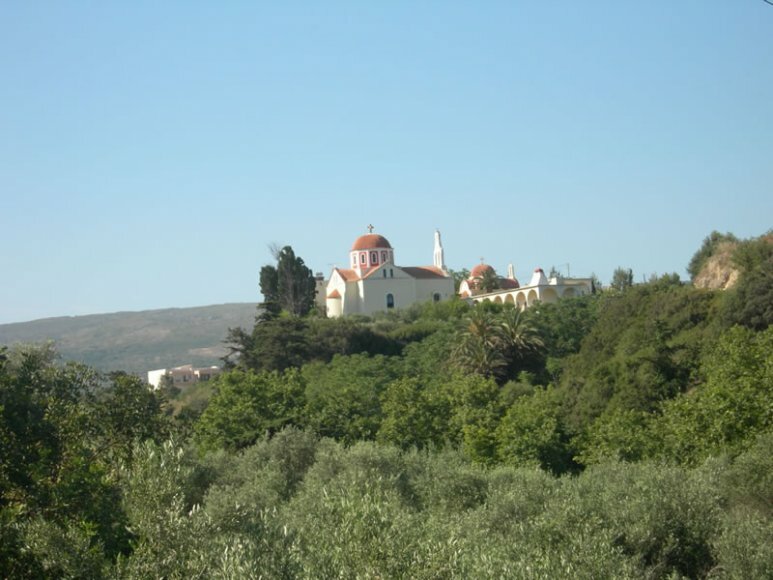 Already in the 16th century the monastery played an important role in the cultural life of Crete. There were many copyist monks, a rich library and a school. 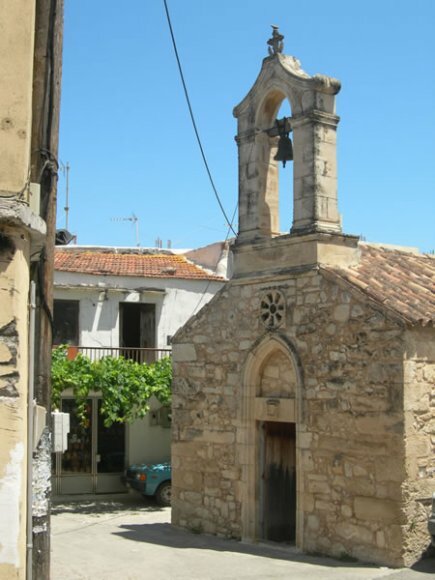 The Turkish invasion reduced its cultural activities for a while, but the Arkadi Monastery was able to recover promptly and received a unique privilege among Greek monasteries: the Turks allowed the ringing of its bells. Lagoumi The gunpowder storage room of Arkadi Monastery The monastery proved to be not only a remarkable cultural centre, but also played an all-important role in the fight against the Turks: when the Turkish Army (15,000 men) surrounded the monastery in November 1866, 300 fighting men and 600 women and children had taken refuge in it. When the walls came tumbling down and the Turks began the massacre, one of the rebels, Kostis Giamboudakis, blew up the powder magazine and the sky-high explosion reduced the monastery to a pile of rubble. This heroic feat is considered one of the greatest in Cretan history and has turned the Arkadi Monastery into one of Europe's Monuments to Freedom. There's a museum in the monastery with many impressive relics of the 1866 Holocaust and some beautiful icons. 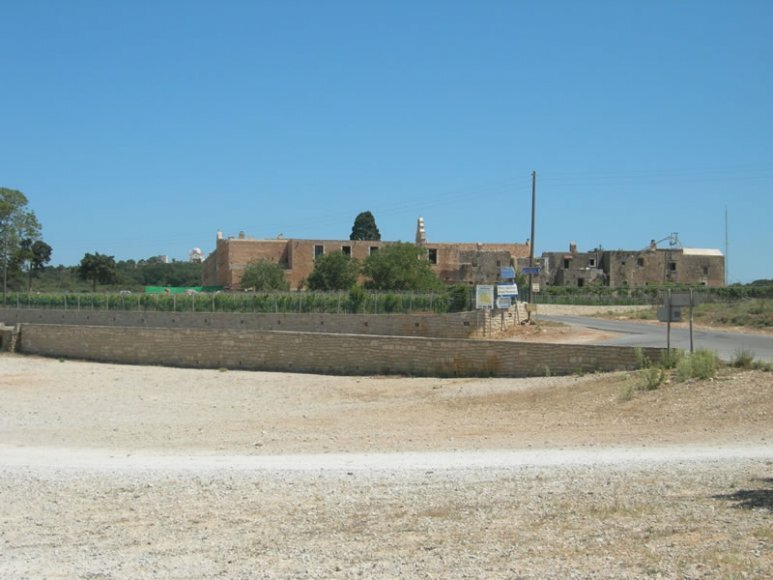 Many efforts have been made for the restoration of the monastery in the last years. Two monks live there.